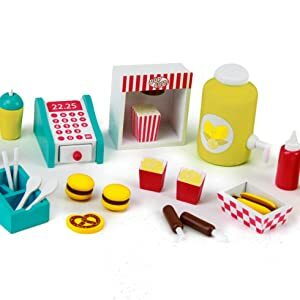 Fun Accessories: The food cart includes 30+ fun Hot Dog related accessories including Hot Dogs, Hamburgers, French Fries, Cash Register, and more! Hamburger and Hot Dog Stand! Our Eimmie Foot Stand comes packed with condiments, hot dogs, popsicles, and more! Rollable wheels and a fabric awning make the the hot dog stand come to life!